Wash and dry the okra and tomatoes. Place the vegetables on a baking sheet, leaving plenty of space between each piece. Drizzle with olive oil. Roll the vegetables around for even distribution. Sprinkle on the salt and pepper to taste. 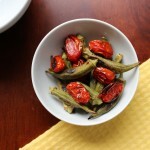 Roast the okra and tomatoes for 15 minutes, turning once. Using fresh, good quality okra is the key to the success of this recipe. I’ve had the best results getting the okra from my farmers market and cooking it within 1 day. Select smaller pods with bright green color. These are the most tender and flavorful. Avoid the larger pods which tend to be tough and woody. For extra flavor, add 1/2 teaspoon Cajun seasoning before roasting. Choose a blend without salt.